Managed Cloud Services - A Virtual Solution With Real World Service. Godlan, Inc. is an ERP reseller, serving clients in the manufacturing sector. The company was dissatisfied with its hosting vendor, a well-known commodity provider. 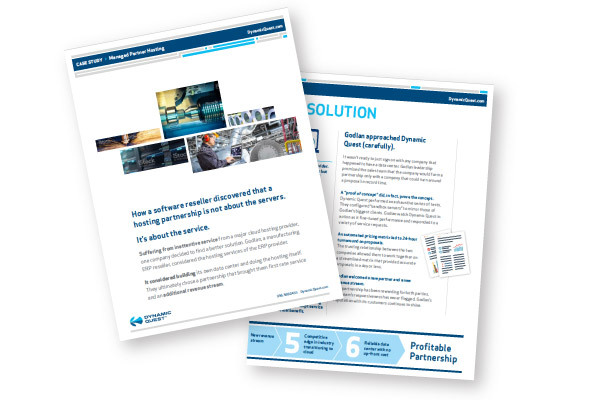 They wanted a better solution that provided their clients with a more stable and cost effective hosted-environment. Here’s what they discovered. It’s not about the servers. Hear from Godlan in this short video, which tells the story of how they found the perfect partnership. Godlan had discovered that no matter how well they customized and serviced their ERP software, they were still at the mercy of their hosting provider when problems arose. Godlan checked out many third-party providers. They liked what they saw, but they needed proof. Godlan was not about to sign on without a thorough test. For a period of several months, Dynamic Quest hosted and serviced a staging version of the ERP application. The idea was to demonstrate reliability and responsiveness—a proof of concept. During testing, we developed a quick-turnaround pricing matrix. Godlan and Dynamic Quest devised an automated pricing matrix that enabled Godlan to deliver proposals to prospects in 24 hours or less. The test was conclusive: Dynamic Quest came through. Godlan migrated to Dynamic Quest. They welcomed their new ability to deliver superior service to their clients. And of course, the company was then able to showcase this performance to prospects, which boosted their new business efforts. To see the full video of the testimonial, click here. Learn now partnering with Dynamic Quest removes hosting headaches and brings in new revenue.